You’ve heard me talk about the In Death series before; it is definitely a favorite of mine. I decided to talk about it this week while Misty at The Book Rat is hosting Love Bites. The series isn’t really “paranormal romance,” but Misty is kinda stretching the definition as long as it includes romance. The only thing paranormal/fantasy about the In Death series is the setting: the future. That involves all kinds of laws and technologies not present in today’s world, but there isn’t any magic or paranormal creatures in the main books of the series. There are over 30 published books, and seriously: I have read them all multiple times. You have no idea how addicted I am. Just writing this post is making me want to pick one of the books up, and I probably will! There is a new release later this month, and it is actually my favorite so far – look for a review of it in a couple of weeks or so. Anyway, what makes the In Death series is the characters. The MC, Eve Dallas, is seriously awesome…and she happens to be married to my #1 book crush: Roarke. Sa-woon. If you haven’t read this series – you have no idea what swoon-worthy really is. Really. 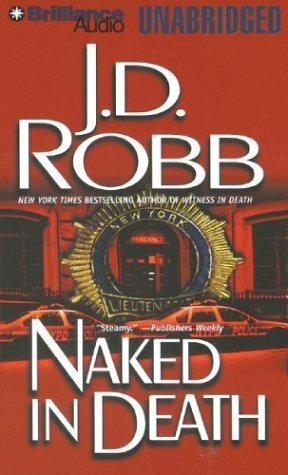 Besides Eve and Roarke, there is a wide and varied cast of side characters that are all wonderful and well developed. The plots are all brilliant as well: whether they involve a mystery or just suspense, the murders that Eve investigates always leave you guessing until the end. They can be pretty violent/graphic/gruesome (fair warning). I think some people are scared off of the In Death series because J.D. Robb is just a pseudonym for Nora Roberts and they’re afraid the books will be run-of-the-mill Nora (although I love a lot of her books!) versus real romantic suspense. I’m here to tell you that these books lead the romantic suspense genre. Pick up the first book, Naked in Death, and introduce yourself to a whole new world! If you’re a romance or romantic suspense fan – you have GOT to read the In Death series. If you already do – tell me who your favorite character is or what your favorite book from the series is! Umm…besides wanting to be Eve. Roark for sure. Yum. But Mavis cracks me up. I love this series. So addicting. I listen to the audiobooks at work. J.D. Robb…ANOTHER author that I haven't read yet! Lol. Guess I should give this series a shot! I have read most of these and keep pushing them on friends. Mavis is my favorite for sure.My copies have been read so many times that they are falling apart though so they are guarded by a ferocious stuffed hamster and are off limits for borrowing. I absolutely LOVE this series .. can't get enough of Eve and Roarke * sighs* ! !